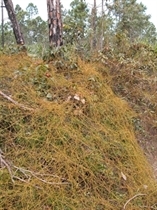 Habit: Cassytha filiformis grows as a yellowish orange parasitic vine to 7 meters in height covering other vegetation and attached via haustoria to branches and leaves. The highly reduced scale like leaves are spirally arranged. The actinomorphic, complete, perfect flowers are arranged in axillary in spikes. The calyx has 3 greenish, unfused, sepals. The corolla has 3 white, unfused petals. There are 9 stamens and 9 staminal nectaries. The ovary is superior with a single locule and ovule. The fruit is a white drupe at maturity. 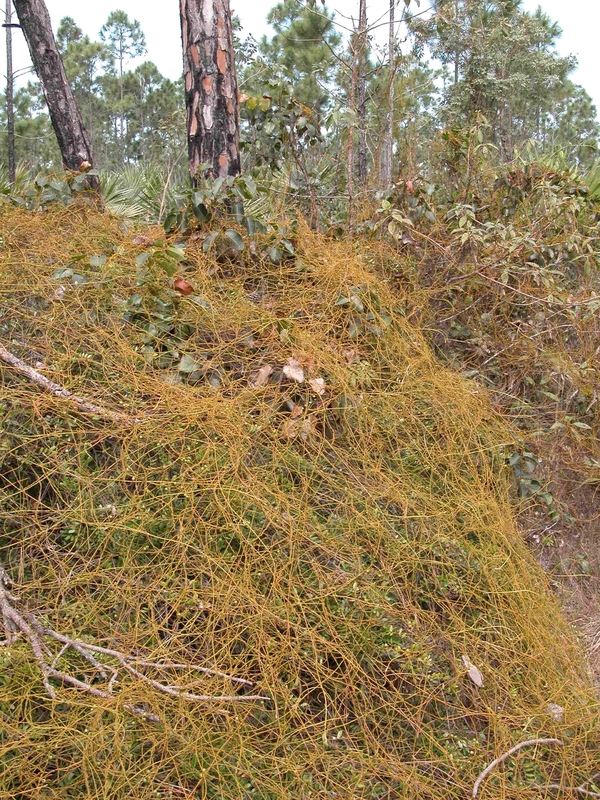 Habitat: Cassytha filiformis grows on plants in Dry Broadleaf Evergreen Formations – Forest/Woodland/Shrubland/Dwarf Shrubland, Pine Woodlands, Dunes, Rocky Shore, Wetlands, and Human Altered Environments. Distribution in Bahamas/Globally: Cassytha filiformis occurs on all island groupings within the Bahamian Archipelago as well as the Caribbean, Southern United States and Tropical and Subtropical regions of the world. Medicinal/Cultural/Economic usage: Cassytha filiformis is used medicinally in the Bahamas to treat pain, dermatological issues, obstetric and gynecological concerns, and in strengthening and aphrodisiac teas.